on Tuesday, February 19, 2019. The open house will include tours of departmental and campus facilities and demonstrations of student projects in civil, chemical, electrical, mechanical engineering as well as computer science. During the tours the visiting students will be able to interface with our engineering and computer science students and faculty. These tours will be conducted between 8:30 a.m. and 1:00 p.m., and will be approximately 3 hours in duration. 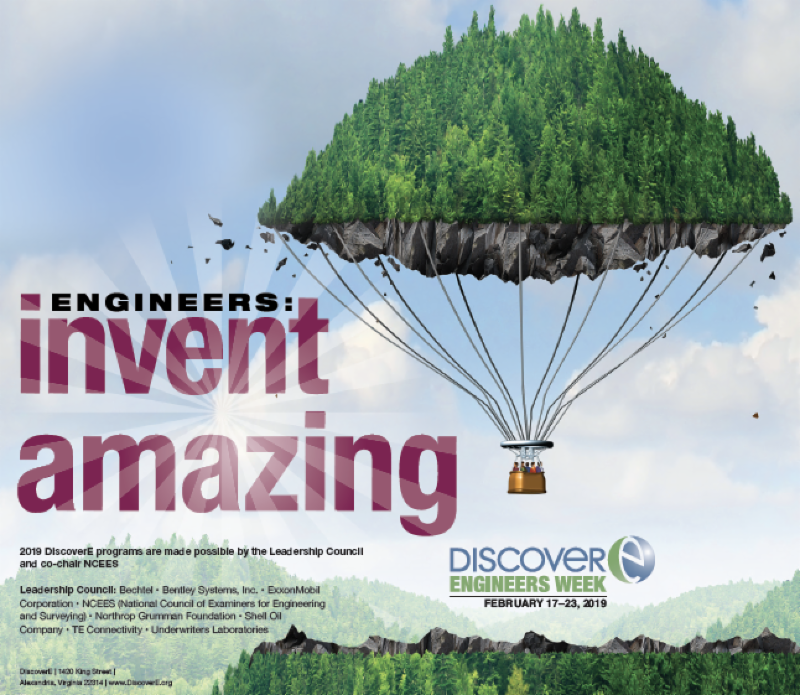 National Engineers Week was founded in 1951 by the National Society of Professional Engineers as an annual event to raise public awareness of engineers and the work they do. It is usually celebrated at the time of George Washington’s birthday. Our nation’s first President was a military engineer and land surveyor. Since 1951, beginning with President Truman, U.S. Presidents have sent special messages of appreciation to the engineering profession in recognition of the week. At the beginning, National Engineers Week included a few scattered government proclamations, dinners, and speeches. It has since grown to involve tens of thousands of engineers in a variety of community outreach activities, such as technology and education exhibits at shopping malls, to presentations of student scholarships. Currently there are hundreds of engineering societies, corporations and businesses, government agencies, and universities nationwide that participate. This year, the National E-Week will be officially celebrated from February 19-25. Our Open House is scheduled for Tuesday, February 19, 2019. As part of the National Engineers Week activities, the College of Engineering and Computer Science is sponsoring a robotic challenge based on the Arduino micro-controller. Arduino Challenge” link. The Sparkfun inventor’s kits along with the orientation gyroscope card will be provided to you by McNeese State University. If your school plans to attend the open house please fill out the registration form now. Once we receive your registration, and if you would like to participate in the robotic challenge, we will mail you an Arduino kit ($150 value) and further information about the challenge so your students can start preparing early. If you decide to participate in the challenge and you accept the Arduino kit, you are making a commitment to attend the competition with a working robot. You do not have to participate in the Arduino Challenge in order to attend the Open House. The Open House and competition will be held in Drew Hall on the McNeese State University Campus. A more complete information package including parking information will be sent to those who decide to attend at a later time. If you have any questions about the Open House, please call me at (337) 475-5875 or contact me via e-mail at nikosk@mcneese.edu. If you have any questions about the robotic challenge, please call Dr. Cate Anderson at (337) 475-5000 or contact her via e-mail at canderson@mcneese.edu. I look forward to your visit on Tuesday, February 19, 2019.